If you have found this weeks bonus you’ll be at Horseshoe Corner, where Market Street, Penny Street and Cheapside meet. There are three different stories about how the corner got its horseshoe and its name. The most popular is that John o’ Gaunt’s horse lost a shoe on this spot when he left Lancaster Castle for the final time and the townsmen fixed it on the spot to commemorate the visit. Another story connects it with the Young Pretender or Bonnie Prince Charlie as he was also known. The third tail suggests it may have been connected with the city’s horse fairs. Finally the trail is up and running and a couple of teething problems have been ironed out it’s time to think about what else we have planned… Each week of the trail we’ll be adding a little something extra a #yarnbombbonus you might say. Some of them will remain for the rest of the trail others will be fleeting as they will be removable treats for people to take home like this week. We’ve been leaving #pygmypuffs around town for people to adopt. Tick tock tick tock… Today’s the day for our Harry Potter inspired yarnbomb to go up in Lancaster. #yarnpotter goes live at 10am tomorrow! 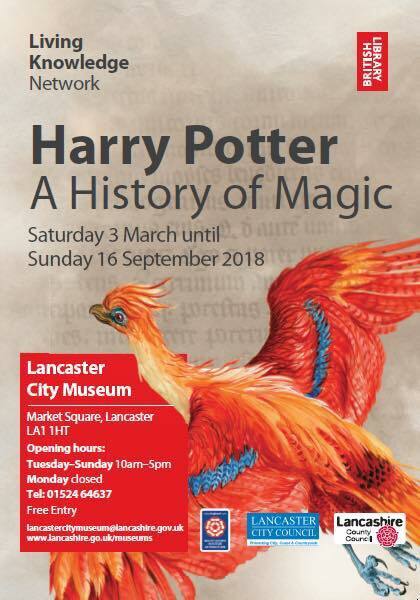 Join us on the trail, we will be highlighting some of Lancaster heritage and sharing the Harry Potter magic. We’ve got our yarn needles and crochet hooks at the ready… its time to go yarnboming!